Metal Cordgrips - Steel, for Flexible Cords - Bolt Products Inc. Exceeds UL Pullout test requirements. 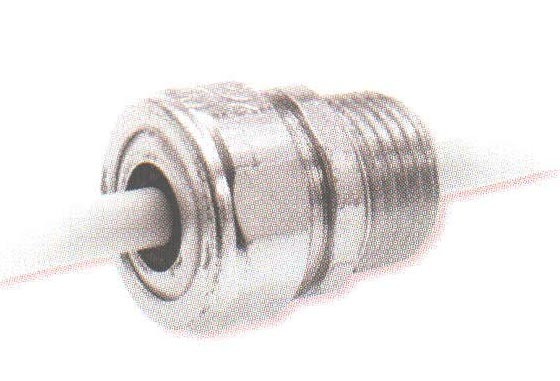 Twelve sizes, with 1/2 to 3/4" NPT hubs, cover a cable diameter range of .150" (3.8 mm) to .850" (21.6 mm). Compact design allows fittings to be consecutively ganged-no skipping knockouts - and occupy less "real estate." Color coded label system identifies the cordgrips by wire range/grommet opening. Neoprene rubber grommet ensures a permanent rain-tight seal around the cable. Galvanized steel pressure ring prevents distortion of the grommet when the sealing nut is tightened. Body and sealing nut are made of corrosion resistant machined steel. Zinc plated with special brighteners for an attractive finish. Overall length may vary slightly depending on cable diameter. Exposed Length may vary slightly depending on cable diameter."